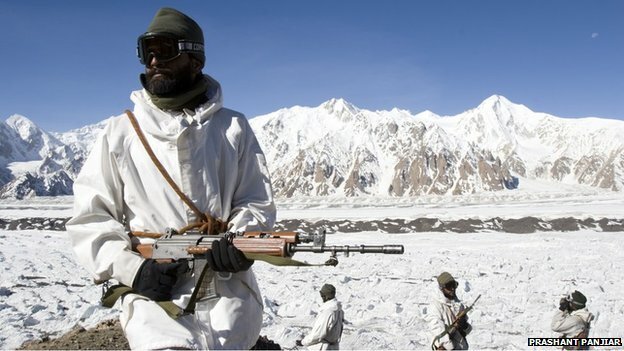 On 13 April 1984, Indian troops snatched control of the Siachen glacier in northern Kashmir, narrowly beating Pakistan. Thirty years later, the two sides remain locked in a stand-off, but the Indian army mountaineer who inspired the operation says his country must hang on whatever the cost. Virtually hidden from public view, the world's highest conflict is moving into its fourth decade. The struggle between India and Pakistan over the Siachen glacier has even spawned a new term: "oropolitics", or mountaineering with a political goal. The word is derived from the Greek for mountain, and Indian army colonel Narendra Kumar can justly claim to be the modern father of oropolitics because his pioneering explorations paved the way for India to take the glacier in early 1984. But what started as a battle with crampons and climbing rope has turned into high-altitude trench warfare, with the two rival armies frozen - often literally - in pretty much the same positions as 30 years ago. 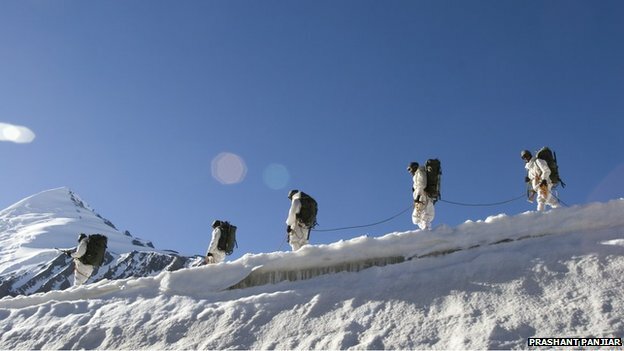 The vast majority of the estimated 2,700 Indian and Pakistani troop deaths have not been due to combat but avalanches, exposure and altitude sickness caused by the thin, oxygen-depleted air. "It's been a shocking waste of men and money", says a former senior Indian army officer and Siachen veteran. "A struggle of two bald men over a comb" is the verdict of Stephen Cohen, a US specialist on South Asia, dismissing the Siachen as "not militarily important". This would perhaps be comforting if the two combatants did not both have nuclear weapons. Surrounded by photographs and memorabilia of his climbing exploits, Col Kumar, now in his 80s, says the struggle was critical to preventing Pakistani encroachment into northern Kashmir. As with so many long-running conflicts, it began with an undefined border. In the late 1970s, a German mountaineer showed Col Kumar a US-drawn map of northern Kashmir marking the Indian-Pakistan ceasefire line much further to the east than he expected. It appeared the Americans had cartographically ceded a large chunk of the eastern Karakoram to Pakistan, including the Siachen glacier. "I bought the German's map and sent it straight to the director general of military operations," says Col Kumar, then in charge of the Indian army's mountain warfare school. "I said I would organise an expedition to the area to correct the map!" But despite several ceasefire agreements, India and Pakistan have never officially demarcated the "line of control" in the extreme north of Kashmir, including the Siachen. And both sides publish different maps depicting their version of the geography. With its ally China to the north, Pakistan was first to see the potential for oropolitics in this strategic vacuum. Throughout the 1970s, it gave permits to foreign mountaineers to climb around the glacier, fostering the impression this was Pakistani territory - until Col Kumar sounded the alarm. But when he got permission for a counter-expedition in 1978, it quickly leaked across the border. "As we reached the Siachen, Pakistani helicopters were flying over us," Col Kumar smiled, "and they were firing out coloured smoke." This and rubbish left by previous climbing teams convinced him the Pakistanis were stealthily taking over. But at first, he complains, Indian generals would not take him seriously. 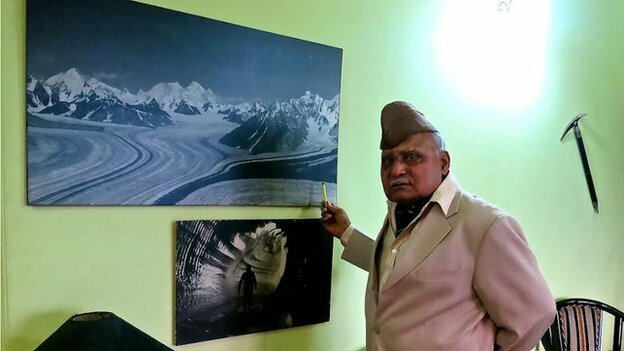 Then in early 1981, Col Kumar was given the go-ahead to map the entire glacier, all the way to the Chinese border. This time there were no leaks. And the following year he wrote up his expedition in a mountaineering magazine, in effect staking India's claim. With the Indian army now clearly involved, the Pakistanis were determined to entrench their claim. They might have succeeded if Indian intelligence had not learned of some interesting shopping in the UK in early 1984. "We came to know the Pakistanis were buying lots of specialist mountain clothing in London," grins Col Kumar. A retired Pakistani colonel later admitted they had blundered by using the same store as the Indians. India immediately dispatched troops to the Siachen, beating Pakistan by a week. By then they had already got control of the glacier and the adjacent Saltoro ridge, using Col Kumar's maps. One of the key Indian installations on the Siachen today is named Kumar Base after him. A Pakistani counter-attack led by a Brig Gen Pervez Musharraf a few years later was one of several that failed to dislodge the Indians. Since a ceasefire deal in 2003, the Pakistanis have given up trying. But though both sides are now better at coping with the extreme environment, it still claims the lives of dozens of soldiers each year. Because it occupies the harder-to-supply higher ground, India pays the heaviest financial price, currently estimated to be around $1m (£600,000) a day. "With all the money we have spent in Siachen, we could have provided clean water and electricity to half the country," says the former Indian army officer. Both armies, he says, ensure their "heroic narratives" of the conflict dominate by limiting media access to the Siachen. Any hints of a thaw, most recently when Pakistan lost 140 soldiers in an avalanche, have always faded away. The Siachen is just the coldest of several fronts in the frozen conflict over Kashmir, with neither India or Pakistan prepared to take the first step. "There will be no movement on Siachen until there's movement on everything else," predicts a former senior Indian intelligence officer. In the meantime, Col Kumar says India should be consolidating its position on the Siachen, by allowing more foreign mountaineers to climb there. Insha-Allah, we will take back Siachen once and for all. It is hindustanis that are playing a dangerous game of proxy war in Pakistani provinces of Baluchistan and Pukhtunkhwa. In addition to which they are also attempting steal water from river Indus, which is a river of Pakistan. Their plans will backfire on them pretty soon. As Pakistan will not stand by and allow imposter taliban and traitor bla goons to continue to run loose. These proxies near the end of their existence. Also, hindus should consider an exit route from Helmand, Jalalabad and Kabul, soon. Because come January 2015, their will be a bloodbath and all foreigners in Afghanistan will be systematically exterminated. I don't really have a dispute with the rest of your post, only those two highlighted words, what do you mean by the 'imposter taliban' ? I hope the two countries realize that human lives are more precious than a frozen wasteland, and disputes can be settled without war too. Catergory B, I can live with, A and C, they bother me. It's the same with everyone else, including you i bet, the problem is our people get so held up and fixated on defining their thinking by defintions made up by tabloid quality media. Good/Bad is only sensationalism, there is nothing "good" about the entire concept, but there are those we can turn a blind eye too and those who are kicking our a55. Impostor Taliban are the TTP. This terrorist group has no allegiance to Islam, let alone Pakistan. They are a breed of rascals who have been funded via various channels of CIA, Mossad, Raw and have been used to not only destabilize Pakistan. But more over, to make it appear to the world that Pakistan's ability to establish control over it's own territory, has been compromised. And the reason behind this objective is to achieve a reasonable level of credibility, which would legitimize the claim that Pakistan's nuclear arsenal is vulnerable and essentially a prime target for the terrorists. As for who or whether there is any such thing as a good Taliban or a bad one. I would not delve into this issue too much. But I would go far enough to point out that the Taliban of Afghanistan are an indigenous, who were conned by CIA's lab monkey's AKA - al-qaeda and have a genuine freedom struggle. They are not to be associated with TTP and should not be generalized with these goons. TTP are not legitimate, they have a foreign hand which manipulates, arms, funds via third-party and often deflect these idiots toward confronting Pakistan's military. TTP = a renegade group of TTA , tafriki , criminal ,uzbek , NA terrorists fighting the state of Pakistan and Pakistani civilians. Then how do you guys explain this? The environment does provide an excellent experience to our armed forces though, and it also gives Pakistani army and Indian army the honor of being operational on the world's highest battlefield. There is no honour in dying unnecessarily because of egos. Its like saying the soldiers of the Battle of Somme had the honour of being involved in the bloodiest battle ever. Not talking about the battle but talking about the operations. Also a different matter of perspective. at 19,800 feet, lack of oxygen alone impairs vital functions, sleep and hunger are reduced . in the most forward areas, indian and Pakistani FOPs are in shouting distance of each other . soldiers on guard duty from both sides routinely share a smoke and a joke . its a pointless waste of good men and resources. Thats very interesting to know! Do you know someone up there in the area or is there a source that said this? both groups are not entirely heterogeneous . TTP has remnants of the original rebels trained by ISI in the 80s . some were killed, some returned to their countries, and some took arms as mercenaries. Siachen Ops is Another example of poor planning by the top brass sitting in GHQ. India and Pakistan both maintain considerable sized forces at front posts as well as back up forces in garrisons behind siachen glacier. Although the posts on both sides are manned by few troops at a time but to lodge an attack it becomes difficult to assemble and move in a large force. Biggest problem is weather which should be favourable for heli drops as assualt on foot can itself claim lives during movement from point A to point B only(land slides etc). Another problem is deploying few men and due to weather change heli has to return and abandon men on ground.getting those men back or supplying them is the new problem. Second is use of helis, not all types can fly at high altitudes and there may not be high numbers of helis available or even if they are avaiable, a singe heli may not carry enough troops so for a sizeable attack atleat 2-4 helis are required to secure dropping zone only. Third is dropping zone, no favourable plain ground to land and deploy troops and fly off. Rappeling or saddling are the choices. Finally in order to take one enemy post or post by post will require a brigade sized attack to ensure success and Pakistan has just tried platoon level attacks in the end of 1980's and that also mostly by SSG supported by regular infantry. The other supporting elements like artillery cover, gunship fire(rare at high altitudes) etc maybe absent most of the times due to weather or comm issues. The use of heavy weapons once on ground in enemy territory is also vital, like RPG, mortar etc. that means instead of deploying 6 men, a heli may carry 3 men and mortar and RPG due to weight limitations. Then supplying these men after a few hours is another issue, weather permitting. The ceasefire of 2003 makes little sense as it avoids conflicts but still takes lives. Other effects on siachen glacier are the waste produced by the troops stationed there is dumped in the crevasses of the glacier that neither decomposes nor can be burned because of the extreme climatic conditions. but there is still importance of this glacier: The glacier's melting waters are the main source of the Nubra River in the Indian region of Ladakh, which drains into the Shyok. The Shyok in turn joins the 3000 kilometer-long Indus which flows through Pakistan. Thus, the glacier is a major source of the Indus and feeds the largest irrigation system in the world.